Wacky Watercooler Welcome 2015 Blog Hop! Welcome back to the first Wacky Watercooler Blog Hop of 2015! This time around, we’ve again been ‘assigned’ another Watercooler member to ‘case’ (Copy And Share Everything) for a project from last year’s Sale-a-bration or Occasions Catalogue, as well as choose a favourite stamp set or product from any of the current, and for the last project, I decided to choose an item that’s currently in the Clearance Rack, that I think you should add to your shopping cart! If this is your first Hop, it’s easy peasy; all the blogs are linked in a circular fashion, so all you have to do is hit either the ‘Next’ or ‘Previous’ button to move to the next blog, or if you hit the ‘Home’ button, that will take you to the Wacky Watercooler home site, where you’ll find a list of all the participating blogs for this hop. I’d like to start with a project I cased from another talented Canadian gal – my friend Terri Antoniw! Terri is amazing, and I’m glad it was her name drawn for me to CASE. The hardest part was deciding what to CASE!! I finally decided on this card; it’s not my typical style, but I love it, so I thought it would help push me out of my comfort zone a bit. Here is Terri’s version, which can be found on her blog HERE. See – isn’t it gorgeous?! Terri did an awesome job on this card – so great, I had a hard time making any changes to it! I didn’t have the Dictionary background stamp that Terri used, so I used the now-retired En Francais background stamp. You can see that I kept Terri’s great layout! (why tamper with perfection, am I right?!). As I said, I used the En Francais background stamp in Crumb Cake, in fact everything is stamped using the Crumb Cake classic ink. The flower is Happy Watercolour from last year’s Occasions Catalogue (I’m crushed that it didn’t carry over! 🙁 ) , and the sentiment is from last year’s Sale-a-bration brochure, a set called You’re Lovely. As Terri did, I coloured in the flowers on the sentiment; I used my Blender Pens with Crisp Cantaloupe, Strawberry Slush and Pear Pizzazz inks. I also did the same with the flowers stamped over the background. 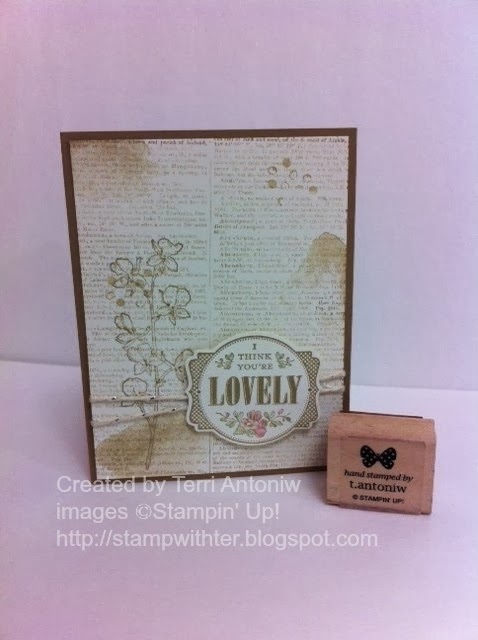 I also used a current stamp set – Work of Art – to add the soft washes & dots of Crumb Cake ink. I stamped the sentiment 2 times; punching out the bottom shape with the Decorative Label punch, and then punching the circle 1 3/4″ Circle Punch, and layering them with Stampin’ Dimensionals. I wound some Gold Baker’s Twine behind the sentiment, then scattered some Gold Sequins onto the front panel. The card front is attached to the Crumb Cake card base using Stampin’ Dimensionals. I think I managed to do Terri’s card proud – what do you think? For my next project, I just had to pull out one of my favourite new bundles from the Occasions Catalogue – it’s the Crazy About You stamp set plus Hello You Thinlits Dies; I bought mine in Photopolymer (#138873) for only $52.50 – a 15% savings!! (This bundle is also available in Wood Mount #139324 $80.50, and Clear Mount #13925 $66.95). With a total of 33 stamps – that’s not a typo – that’s 33 stamps! – 30 sayings & 3 images; this is one of the best deals in the catalogue! How’s that for an eye-popper! 🙂 I just love these bright colours! I bet your wondering what on earth I found on the Clearance Rack that I thought you should add to your shopping cart! I do admit, I’ve had this kit sitting around for a while, just waiting for some inspiration to hit…when I finally opened the kit, I was WOW’ed at how much there is inside!! 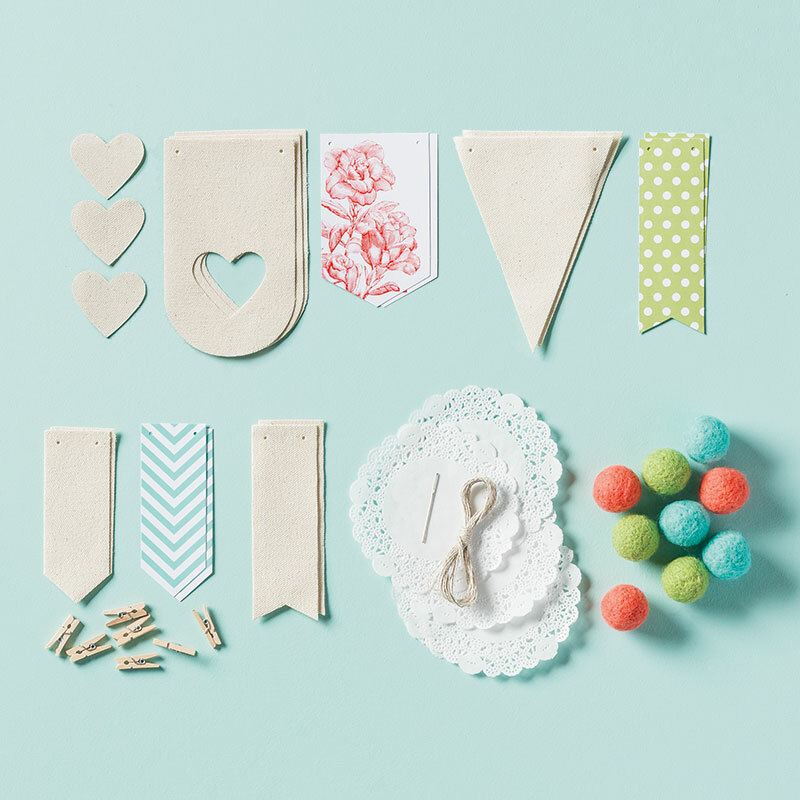 This is the Heartfelt Banner Kit, and marked down from $24.95 to $9.99 is an amazing deal! The canvas banner pieces are really easy to stamp on with our Classic Inks; the fern was stamped once full strength in Pear Pizzazz ink, then stamped again without reloading the ink. I stamped the flower image first with Memento Black ink, then used our Stampin’ Write Markers in Crisp Cantaloupe, Strawberry Slush, Pear Pizzazz and Old Olive to colour it. I brought in the Butterfly Basics stamp set and Butterfly Thinlits Dies to stamp the sentiment & butterfly in Crisp Cantaloupe; I used the Decorative Label punch for the sentiment, and the medium sized Butterfly thinlit to die cut the butterfly. I used the Linen thread that is included in the kit to tie the 2 banner pieces together, then layered everything on the Crisp Cantaloupe card base using Stampin’ Dimensionals. 3 Basic Pearl embellishments in the bottom right corner balance it all out. Since my blog is last on the Hop, depending on where you started you may have already seen the fabulous projects created by Priscilla Ivler, but to see them again just click the ‘Next’ button; if you want to go back & see Stefanie’s creations again, click on the ‘Previous’ button. I’ve listed all the participating blogs below, plus all the (current) products I’ve used. If you’d like to purchase any of them, just click on the picture, and you’ll be taken directly to my online store. Thanks again for visiting – until next time; Happy Stamping! I have to say you did Terri’s card proud! As usual you rocked this one! Great CASE, I love your stamped canvas. Thanks, Kath!! It was lots of fun doing these projects. Wow – thank you so much, Terri! Right back at you, my friend! 🙂 Let’s make sure we keep in touch – you can be a guest creator on my blog!! 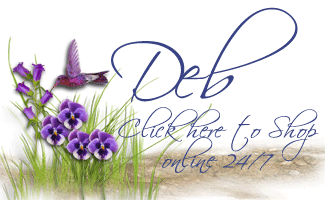 Deborah, your creations are wonderful! 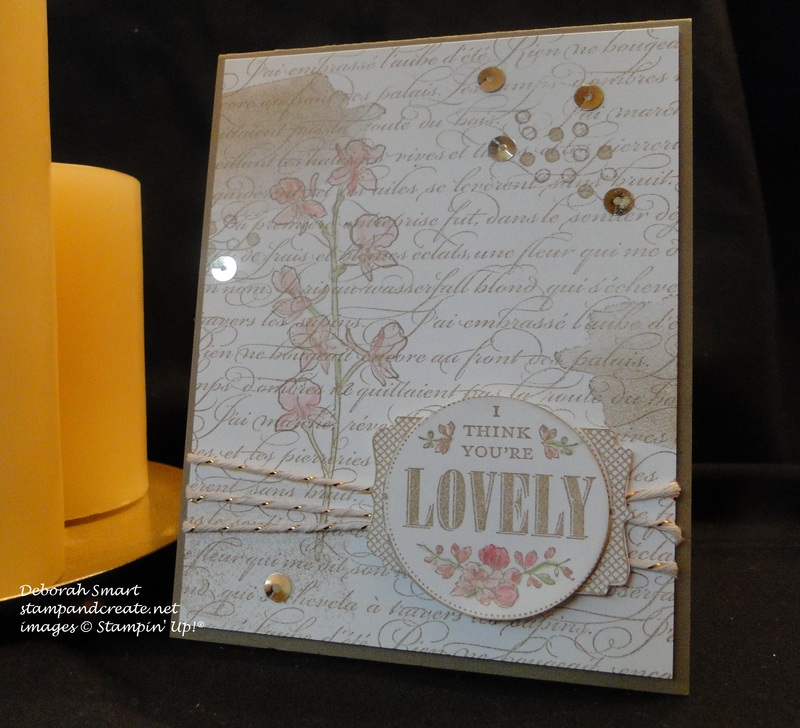 You certainly “did Terri proud”–both cards are beautiful! Adding “hello” to the Crazy about You set was genius! I’m going to CASE that…also loved your canvas work. Such a super blog post! Thanks for the inspiration. AMAZING!!!! What a way to end the hop!! Bravo, my dear! Stunning as always! You never disappoint with your projects. Do you know I have that kit and have never done anything with it? I didn’t look beyond making a banner with it. I am inspired. Thank you for being part of this Blog Hop. You did a wonderful job with your CASE of Terri’s card. The changes just give it a different, more feminine flair. Your Hello card is terrific—love those colours. I, too, bought that set in Photopolymer partly because of the cost but primarily because I can see precisely where the words will be stamped—something that can really matter. What a great card you’ve made with that find from the Clearance Rack. You couldn’t buy all those pieces separately for such a low price. 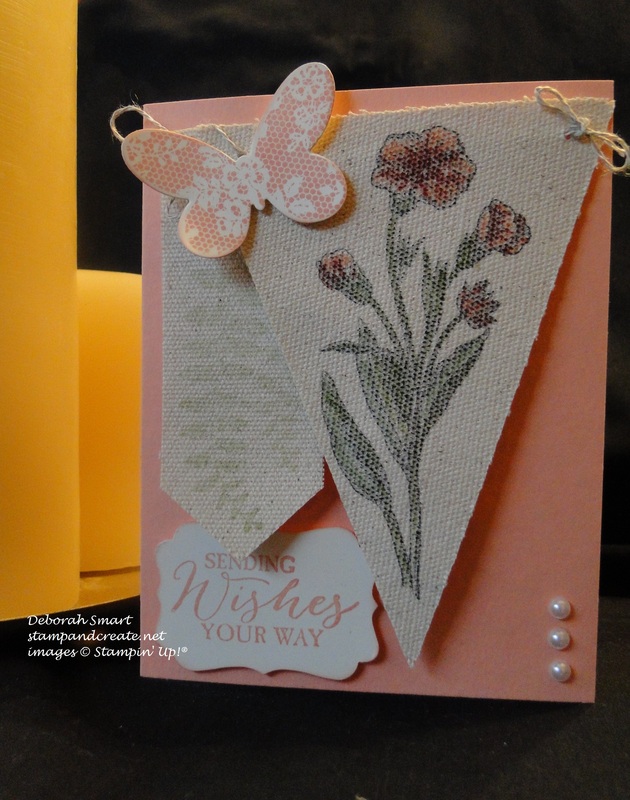 And the card, with the stamped canvas and the butterfly from the Butterfly Basics set—what can I say? Inspirational. Your CASE is stunning! Love all your projects though! 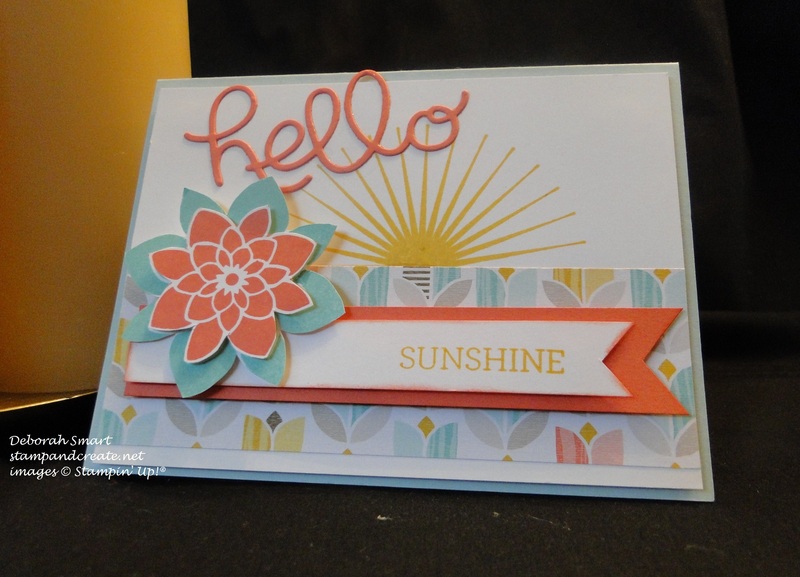 Deb, I love them all; you did a fabulous job with the vintage card and the banner pieces, but my favorite is easily the bright & cheery hello sunshine!